BACK Miniature Kites by Tom Tinney - A collection for your viewing pleasure. All kites in Will of the Wind's minature kite collection are handmade in the USA by Tom Tinney, award-winning kite maker of LittleKites. 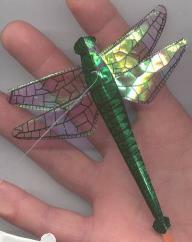 They happily fly indoors or outdoors, are fun conversation pieces, make unique gifts and are simply delightful. Roll mouse over each image to enlarge. * These beautiful and delightful little kites are no longer available for purchase, but this page will stay at Will of the Wind for you to enjoy viewing the craftsmanship of a master.